Greta Marlatt has another honor for her bookshelf. The Dudley Knox and Homeland Security Digital librarian received the Lieutenant Commander David L. Williams Outstanding Instructor Award for the fall 2016 quarter. The honor is named after a Naval Postgraduate School Alumnus who was killed in the September 11, 2001, attack on the Pentagon. Librarian Greta Marlatt in her office at the Dudley Knox Library. “I love what I do. I don’t go look for awards but I am sincerely honored,” Marlatt said. 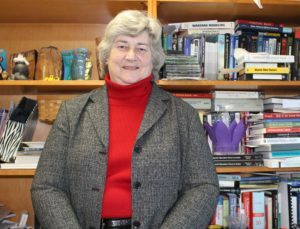 With more than 30 years of service in the field of library science Marlatt is a favorite among students for her after-hours accessibility and her expertise in research techniques. 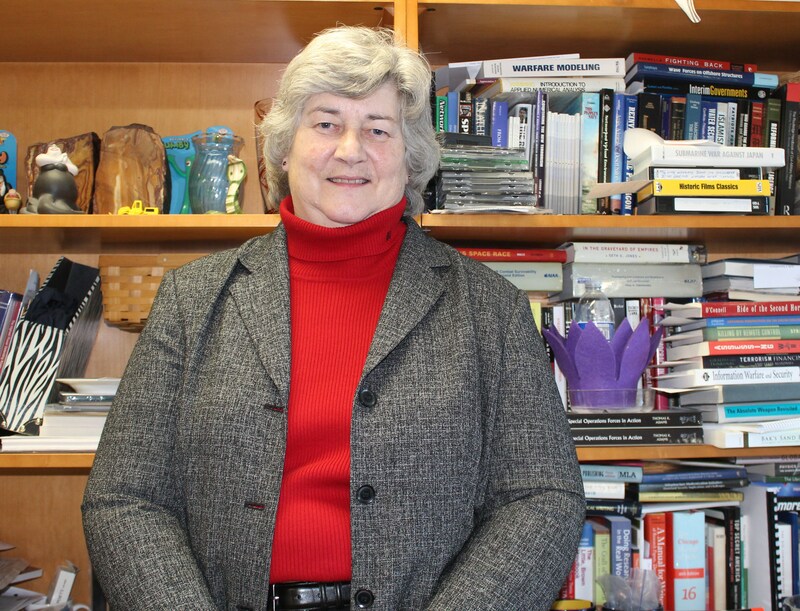 About half of her time is devoted to the Dudley Knox Library where she manages outreach while supporting faculty and staff, with an emphasis on serving as a liaison to the NPS School of International Graduate Studies. She is known to Center for Homeland Defense and Security students for her work at the pioneering Homeland Security Digital Library and for guiding professionals through the maze of research and writing demands of the master’s degree program. In addition, she is an instructor in the CHDS master’s degree research and writing course while playing a critical role in ensuring the saliency of master’s degree theses. Better than any award, she said, is the one-on-one time spent with students, guiding them on their thesis research journey. Marlatt’s path to library science began during her undergraduate years at Arizona State University. A work study job in the library whetted her appetite for the profession and led to a Master’s of Library Science at the University of Arizona (she would later earn a master’s degree in \security studies at California State-San Bernardino). “It was not what I intended to do with the rest of my life but I realized I enjoyed what I was doing,” she said. In doing so Marlatt has left a mark on the field, authoring numerous academic articles and gleaning honors ranging from a 2012 New York Times “I Love My Librarian” award to the Navy’s Meritorious and Superior Civilian Service Awards. Better than any award, she said, is the one-on-one time spent with CHDS students, guiding them on their thesis research journey.